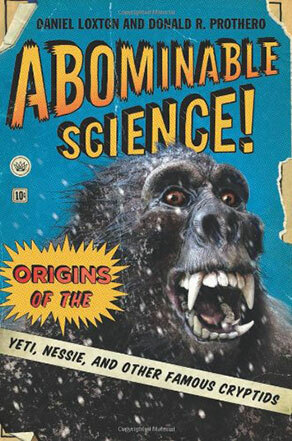 The cover of Abominable Science! : Origins of the Yeti, Nessie, and Other Famous Cryptids may resemble a 1920’s-era science fiction magazine, but the contents are educational, entertaining and downright skeptical. With years of experience in investigating paranormal claims and teaching critical thinking, the combined powers of Daniel Loxton and Donald Prothero present the arguments for and against the existence of the most famous (and debated) monsters in history. Abominable Science takes on the likes Bigfoot, the Loch Ness monster and Mokele-Mbembe (or the Congo dinosaur)—all delivered in a colorful and analytical fashion. If you ever had any questions about the psychology and cultural influences behind the stories that had you captivated as a kid (and for some, still believing in their existence now), then this is the book you need on your shelf. Daniel Loxton: A little bit! Kylie: Yes? Oh, good guess then! Donald R. Prothero: We started talking about the project and immediately it became apparent that each of us has different strengths and different research interests. It became my task to do things talking about methods of science and why cryptozoologists don't practice real science. I had, of course, a natural interest in things like Mokele-Mbembe. As a paleontologist, that one was important to me. Daniel has years and years of experience working with Bigfoot and Nessie, so it was obvious he would do those chapters. Kylie: Was there any particular monster that you then became intrigued by because you hadn't gone into it in‑depth before? For example, Daniel, was there anything that you'd always wanted to research and now had the chance? Daniel: This book is a natural continuation of the work that I've been doing for years at Skeptic magazine, particularly for “Junior Skeptic,” the kids’ section. There were some interesting discoveries that I really didn't anticipate. One is this idea that the Great Sea Serpent of the North Atlantic may be traceable back to a classical Greek artistic motif of this creature called a “hippocamp,” which is half horse and half fish. There were some very interesting correlations that came out when we started putting together the timeline for the evolution of the Mokele-Mbembe legend—it turns out this creature popped into popular consciousness at almost the exact same time that the first sauropod dinosaurs were mounted in North America and Europe…which is likely not to be a coincidence! Kylie: You've got a fascinating correlation between culture and monster discovery, don't you? Daniel: I found it fascinating! For my money, these mysteries don't become less interesting if there's an absence of physical, biological monsters stomping around the world. Stories are interesting in themselves. Mysteries are interesting in themselves. Monsters are interesting in themselves. It's the cultural aspects of them. For me, it's a gripping path to follow. Donald: That's something that's striking about this as well, to me. I hadn't read it as much as Daniel had, when we started this, but how much it's really a pattern of cultural copycat behavior, basically. One report, one hoax, or one movie event, and suddenly, there are a thousand sightings. Then they taper down again. Then another hoax or another movie event, there are a bunch of sightings, and then they vanish again, which is a classic cultural copycat pattern. It has nothing to do with anything biological at all. Daniel: The creatures changed over time too. They evolve with the fashions of popular culture. It's a feedback loop between the eyewitness records and the eyewitness testimony that emerges and the pop culture that feeds off it and, in turn, feeds it. Kylie: Were there certain overlaps worldwide, in terms of cryptozoological claims? Obviously, lack of evidence doesn't stop people…which is true of a lot of things, let's face it! How well do they overlap, in terms of particular legends? I guess I'm thinking of Bigfoot, for example, which is one that has been translated across different cultures, different times, and appears in all sorts of guises, doesn't it? Daniel: It does. I'm most familiar with the English‑language literature on these creatures, but those are, in many cases, international mysteries. They are infectious across international borders. The Yeti idea, the popularity of that in pop culture, it's very likely that that helped to trigger the explosion of the modern Bigfoot, which is only peripherally related to earlier First Nations traditions in North America. You get this international contagiousness. Donald: Especially when things like movies cross borders. “King Kong,” made in the United States, goes to Britain. Lo and behold, you suddenly have a new version of Nessie out there. Daniel: We make a fairly sound case for that in the book, that the release of “King Kong” inspired the Loch Ness Monster! There really isn't a firm tradition of a monster in Loch Ness before the release of “King Kong,” and then it starts within days. It leaps out at you when you start putting together the timeline and breaking down, deconstructing the fictive timeline that grows up around these creatures. Donald: Even though we didn't have a chance to tell you much about it in the book because we had to chop the chapter on the chupacabra out. The chupacabra is a classic example of, basically, a media‑created creature. It was born from a movie, this movie “Species,” in Puerto Rico. Then it went from the imagination of the Puerto Rico tabloids to being international, Latin America. Soon, it was on “The Cristina Show,” which was a show that was the Oprah of Latin America, all over Latin America at that point. Instantly, in every Latin American country, there was a chupacabra report, right after it was aired on “Cristina.” There was almost no biological signal there at all. Kylie: Wow. I guess that's another aspect about your book. How do you choose? You mentioned already that there were English‑language translations for some things. That had to narrow some of the work. Although I'm certain you could have found some elements that were cross‑cultural, and therefore inspirational. Then chopping, having to leave out sections. How did you choose what was going to become in the book then? Donald: It wasn't really a choice! We ended up writing way more than we were contracted to write. A couple of chapters I wrote are sitting there in limbo now. We're not sure if we'll save them for the second edition or something like that. It was way over length at the point that we reached a certain point. Those things happen. Daniel: The finished book is over 400 pages. You could bludgeon somebody with it! Donald: Over ninety pages of notes too! Kylie: It was the first book I downloaded onto my iPad. I thought, “This looks so impressive. I can't wait for the hardback copy. If it looks this beautiful on iPad, it must be tremendous in hardback.” It does look beautiful in both ways. Daniel: Columbia Press really gave it fantastic support. It's a beautiful reading object. Donald: One of the things we're really pleased with, of course, is they went with a very nice, heavy, glossy stock for the pages because of the color art that Daniel has in there. Of course, as you said, the book's really heavy for a book that size. Everybody at TAM last summer was picking it up and acting like it was picking up a brick. We were joking you could kill a Bigfoot two ways: You could use the evidence in the book or hit it over the head with the tome. Kylie: Nice. That's the way to go. How did you end up narrowing it down? Was it again flipping a coin, or did you just say, “Fabulous, but just not now”? Daniel: We kept the strongest chapters and the ones that had the greatest run at making an original contribution to the literature. The chapters that we ended up cutting, they were covering ground that Ben Radford, Joe Nickell, and others have dug into quite extensively in the past. Kylie: The power of the editor, valuable. Daniel: Going back to your question about language though, there is a little bit of material in the book. We had to commission a few translations for some key documents. It was quite a lot of sleuthing that had to go into this thing. Donald: I had to dig up my late Latin to translate one thing for that book. Then I had to ask a native German-speaking friend to polish our German in another place. Daniel: Latin, Gaelic, all kinds of weird stuff in there. Daniel: Yes, you did. Thank you very much! You contributed! Donald: You got your photo credit there! Daniel: They're big birds. A swan attacked me one time, in the park, a big white swan. It's a strong memory! Kylie: I got really lucky. It wasn't quite spring, so it wasn't looking after the goslings. It just came over to me to pose beautifully. It was lovely. Donald: They used to have one of those in the LA zoo. They have something else there now, so we don't have one. Kylie: Apart from the potential of getting attacked by swans—is cryptozoology a potentially dangerous field for people, or is it a fairly benign belief? We already spoken about how there's lack of evidence, but you get fabulous stories, fabulous accounts, connections across countries, and a passion for it. When does it get dangerous? Can it be a problem for people to believe in these things? Daniel: There are sort of two ways to answer that question. One is to look at particular cases. It's gotten really out of hand in some cases. There's a case of a man killed hoaxing a Bigfoot sighting, run over in the highway. There's a case of one researcher firebombing a competing set of researchers, over the Loch Ness. It can get wild, wild and hairy! Donald: They get pretty nasty with each other in the media, too! My viewpoint, especially as I express it in our last chapter, my biggest concern as a member of the US population, is that we have a giant problem with creationism in this country. Much worse than Australia has and much worse than Canada, it's literally a life‑and‑death issue as far as science, as far as I'm concerned. There is a big connection there, as Daniel and I both documented in his book. Because there's a lot of connections in the way creationism has promoted cryptozoology. Most of the research on Nessie and on Mokele‑Mbembe is now done by creationists. It's a big part of what they think is their ministry, because they have this bizarre notion that somehow if they find a Mokele‑Mbembe all of evolution will come crumbling down, as if one late‑surviving species somehow changes anything. That shows how little they know about evolution at all. Then, of course, the incentive for this is to promote creationism. It may not scare people in Canada or Australia as much as it does, but it does scare me here in the US. Daniel: I was just going to agree with Don that the Mokele‑Mbembe, in particular, is a case that's really by, of, and for creationists at this point. All the expeditions in recent years, they've all been purely...They're really missionary expeditions. They're composed entirely of Christians, and they spend much of their time doing missionary work. Taking altar calls and spreading the Gospel, and incidentally maybe looking for monsters. Donald: Yeah, incompetently looking for monsters, too, because they're not trained as biologists! I was on the episode of Mokele-Mbembe when the Monster Quest people did it. I was only in it about five minutes as the one token skeptic. When I finally saw the episode aired, the entire rest of it is these two creationist ministers, with zero training in biology. Bumbling around the river, not knowing how their own equipment worked, not knowing the first thing about the animals in that region. It was painfully obvious to anyone with biology training: these guys are not biologists. Daniel: This speaks to one of the contributions that Abominable Science makes to the literature. In the past, this creationist angle has been systematically downplayed. Both, it's downplayed in the mainstream cryptozoology literature, and it has rarely been mentioned by critics, by skeptics. We were able to get into that in some depth, also into the paranormal angles of cryptozoology. Cryptozoologists tend to present mainstream cryptozoology as a scientific enterprise pursuing biological animals, just like any other animal. Except these ones have yet to be properly documented. But, in the eyewitness database, there's a tremendous amount of this paranormal material or supernatural elements, glowing eyes and teleporting Bigfoot, and bulletproof Bigfoot. And Bigfoot coming out of a UFO, and magical spells, summoning the Loch Ness Monster, and finding the Loch Ness Monster with dowsing, and all this stuff. It's actually very, very common. But it has not, in the past, been discussed properly in the literature. That's why they're trying to lighten that. Donald: They vanish as soon as they die, if they die. You can push that any way you like. Kylie: If you have creationists in the field; if you have people with little training doing research into this area—and here you are writing a serious and fascinating book—then how many scientists take this field seriously? Is cryptozoology seen as a legitimate field? For example, in Australia, you have lots of people interested in extinct animals possibly surviving; you have the case of the coelacanth that has been rediscovered. What is this general attitude towards cryptozoology by science, do you think? Daniel: I would suggest that there are two ways to answer that, as well. On the one hand, there is the question, is what you might call ethnobiology, is that approach a valid approach? Then, the other question is, how do scientists feel about mainline cryptozoologists? Donald: I was just going to say, the main reason being, these ethnobiologists are actually looking for real animals that aren't that spectacular or strange. Like a new species of mammal of a small body size, none of which startles any biologists if they're doing their job. Daniel: ...But, not so many giant monsters! That exercise has been ongoing for decades! All the primary evidence that...the evidence that cryptozoology rests on, that has all, from time to time, been given a fair hearing by mainstream scientists. Donald: Yeah. Yeah. More than fair, in those cases, yes! Daniel: Yeah, more than fair! Donald: That really raises the other aspect of this. As a working scientist myself, we have only limited time to do this stuff, right? We all have research careers, usually that are dictated by a certain schedule. We have our families. We have other time commitments. They expect us to drop everything and actually pay for them to do this stuff, sometimes, and they expect us to spend a lot of time looking at it. The result is that most scientists simply don't have any interest, because it's an obvious waste of their time and they know that. What they more often do is just ignore it. But, then there are quite a few legitimate scientists. I count a number of them among my colleagues as well as myself, that have spent the time. My colleague Christine Janis, and Darren Naish, and there are quite a few legitimate, well‑trained, well‑respected paleontologists who do give it quite a bit of time. But, they're also inclined to the scientific method, and being very strict about the quality of data. The problem I think arises is not so much is that we haven't given them the time. It's that they don't like what we tell them, and they expect us to somehow look closer and spend more time, and somehow come up with a different answer, which isn't going to happen. Daniel: Humanity, as a whole, and certainly the scientific community, only has so much resource to work with. At some point, some of these things you just have to write off as a bad bet. Kylie: What has been the response to your book by people who do believe in such creatures existing? I'm glad you find that funny because I thought as being presented as such a lovely large detailed book make some of them go, “Wow, great another resource to add.” Is it a positive response that you've got? Daniel: You would think that it would be positive since it makes a contribution. It makes a number of contributions! Don and I have a running bet about this. I come from cryptozoology; I was interested in cryptozoology long before I was aware of the skeptical literature. My heart is really with cryptozoology. I prefer to hope for the best from cryptozoologists. I prefer to expect a very collegial response, not agreement with the book. It's a fairly robust challenge to much of cryptozoology, but I expect people to approach it in good faith and in a fair minded way. Don's expectation was not the same. Donald: Yeah, I come from a place of creationism is so dominant that it's been a major part of my battle for over forty years of fighting creationists who play dirty and play fast and loose with facts, and lie through their teeth at every opportunity. I don't trust them any further than I can throw them! Unfortunately, I expected that the cryptozoologists who had the same kind of psychological roots that they were deeply believing what they have so long spent their time on. They're not going to easily give that up, in which case they'll rack just like creationists do with their usually lies and dodges, and sure enough that's what happened. Daniel: What do you think the score is, Don? Donald: Well, we had what? Two or three that were fair to us between Amazon and the other types of media that we heard about, such as some of the websites. Daniel: We weren't totally naïve—there were a few fair ones! Donald: Then there were the other ones that spent their lives doing this, gave us four pages of why they thought we were wrong. All of which, of course was wrong because they didn't read it carefully! Daniel: “The Big Foot Times,” was not very pleased with us. We've getting some letters of complaint to the publisher, some calling for the book to be recalled. Not in every case as a collegial as one might hope. I'll say that! Donald: The irony was Daniel was went to the time to actually answering many of their stuff and put it on a Skeptic.com blog post—because they didn't do their homework as well as he did. He knew their facts better than they did. They were all, again, missing the forest through the trees. They would nitpick about little details about one particular story or one particular account. They never read my first chapter, which is focusing on the fact that the evidence they have is crap. That's really what demolishes everything that follows is the case in the beginning of the chapter. What quality of evidence that you have to have to convince science. They don't even care for that stuff. They admitted that they had never read the first chapter. It shows again, they don't look at the big picture. They just focus on the narrow stuff that's near their heart. Kylie: I thought that was really valuable that first chapter. I thought that was an excellent thing to include. I was really happy to see that. Daniel: I'll say to anyone: whether a cryptozoologist, a creationist, a UFOlogist, a skeptic, a scientist, anybody. If you are publicly reviewing something that you have not read or a restaurant that you have not eaten at, or a film you have not seen? There's really nothing for it except to just retreat in shame. Donald: Creationists don't have any shame when they don't read something and they still attack it. Daniel: I don't mind being torn to shreds…if you don't read the damned thing first! That's how it's done. Kylie: I think it's true for absolutely everyone. I've known a few skeptics guilty of that, as well! Yes, people go out and read this book. It's awesome. I really love it. Kylie: What are your next projects? Daniel's got a new book on dinosaurs that are going to be stomping our way soon, after having them attack and swoop down on us all. What's on the cards for both of you, in terms of coming up next? Daniel first. Daniel: Well, my “Tales of Prehistoric Life Trilogy,” is out in the spring. That'sPlesiosaur Peril! I'm not sure of the release date for that. I think it's around March. Then, otherwise, I'm concentrating on Junior Skeptic; I'm doing a little bit of innovating there. I'm taking a break from projects, recharging, and dealing with my first love, Junior Skeptic. Donald: I've got a couple of projects that are actually contracted. I've got to work on. They have a thing called, “The Princeton Series,” a field guides which have already had long done and their stores. I'm currently working on a guide to prehistoric mammal. That's my big project right now. I've got a couple of projects that are in the works that I haven't got firm contracts on. I've got a new book on paleontology from Johns Hopkins coming after that next one. Kylie: It's all good. I'm looking forward to all of them, my goodness. After giving birth to a 400 plus page baby, I'm surprised you still have the energy. You guys are amazing. Daniel: It takes some doing. It's the work of several years!